Australia has some 6,000 species of native snails, none of which pose a problem to our gardens. There are even some that are carnivorous and enjoy to snack on the common (introduced) garden snail. The common brown snail Cantareus (Helix) aspersus is a nasty introduced species from Europe and is found throughout all temperate regions growing to around 45mm long. It can take from 4 months to 2 years to mature and can live as long as 12 years! Snails are hermaphrodite (have reproductive organs normally associated with both male and female sexes) and during warmer months can lay several egg clusters at a soil depth of 20-40mm. These clusters may contain as many as 100 eggs and one snail can lay up to 1,000 eggs in a season - no wonder they are hard to handle. 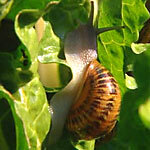 Snails like to live on vertical surfaces in the heart of strappy leaved plants and in crevices. So check under leaves and in the crevices of leafy plants as well as under pots. If you have chooks, even better as they just love them. Hand picking, will over time, greatly reduce the number of snails. The best time is after sunset by torchlight, and this is simply the BEST activity for kids as it is a real adventure as to who can pick up the most snails! If you don't have chooks some sudsy water in a bucket will do the trick. There's something about an Aussie and beer..... and snails are no exception (they've integrated excellently into the Aussie culture!). They just love the stuff - get some old jars or cans, place them on their side slightly tilted down, around the garden and pour in a little beer - they are very attracted to the lovely yeasty brew, climb in and drown ta-dah! If you don't like the sound of either of the above methods a very effective method is to use copper banding (this works especially well on pots and seedling trays). When the pest makes contact with the copper band it causes a reaction similar to an electric shock which repels them. This introduced species to our Australian shores is just amazing how it has reproduced over time and any method that works to limit it's numbers has to be a plus.